I go and say I am going to start blogging more often and then I go and not post for 4 days. Well there isn't loads of nexs at the moment. So today I am going to talk about Ship Simulator 2008. The game is a simulation of many different boats including passenger ferrys, tugs, water taxis and even container ships with controlable cranes. Then there are sevaral differnt places to sail such as ports (New York) and seas (English Channel). 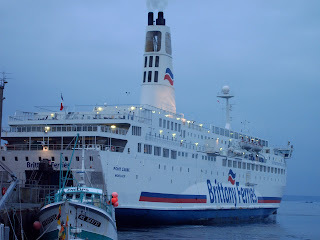 Then you can do differnet mission such as sail a P&O ferry from Portsmouth to Rotterdam or Tow a ship into dock with tug. Or you start from where ever you want and then just cruise around. There will also soon be add-ons for new boats and locations just like in Train Simulator. A very good game. I would definately recommed it. It is avalibe for around £25. Around Penzance they have been replacing the older Dennis Darts and Leyland Oympians and the departed Bristol VRs with mostly '53'reg Dennis Darts with various route branding for different places. 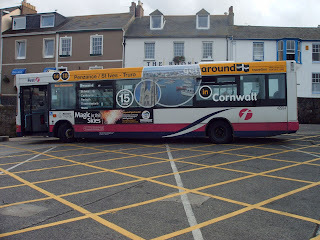 As is shown with the picture above of route branding for routes 14 and 18 Penzance to St Ives. This is all done as part of the rural bus scheme. Its all very good but I would much prefer as a bus spotter to have a big long rural route linking everything up and with the old buses like the VRs. I know its not practical but they shoild do it just for us. 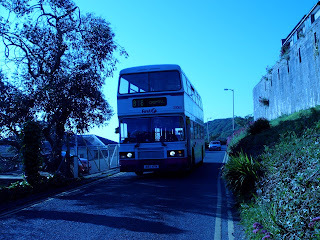 Spotted in St Ives today on route 314 ex-Torpoint Leyland Olympian 30065 (Sorry I didn't get a picture) was spotted going to Camborne. She was transfered to Plymouth early this month and has now been trasfered to a depot somewhere near the bottom of Cornwall. She will probebley be running routes like the 301, 314, and 2 which are often covered by Leyland Olympians. So they are not done with her yet. I think the Olympians will last quite a lot longer down there. I am back again. This time I will be doing news from deepest Cornwall in short blogs instead of 1 big blog and I will now try to be a bit more constant with my bloging as I haven't been at the moment. Just to let you kow I am on Holiday again until Friday so I will not be posting. I will bring some news back from there. 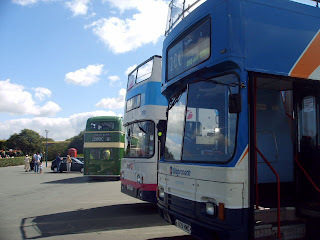 Today was the 22nd annual Plymouth Hoe bus rally which saw around 40 buses attending with about 8 of them doing trips around Plymouth but more frequently this year in place of the runing day on Saturday which didn't go ahead. There were also Limos on display, fire engines and a few stalls. And to finish it all of the weather was lovely. And I was wrong about the Torpoint VRs not being there. Colin Billington speciallly MOTed LFJ 847W just for the rally this week. Well done Colin it was lovely to see her again. 34002 the Torpoint Volvo Olympian has returned from her short visit to Callington. She has now been fitted with an LCD blind. She has been working the Millbrook school run in place of a Trident because of a Trident shortage at the moment. And has been used on 81C. On Sunday the 2007 Plymouth Hoe bus rally will he held on Plymouth Hoe. This will be held from 10am until 4.30pm with a few free rides thought THE SATURDAY RUNNING DAY IS NOT HAPPENING. There will be stalls which will sell model buses, programs, DVDs and other memorabilia. There will be around 30 buses a bit down from usual. There won't really be many real local buses as OTA 290G won't be there, LFJ 844W is waiting for painting and is in so fit state to be on dosplay, and LFJ 847W has no licence at the moment. I am sure it will be a good day just without the real highlights that I love about the show. 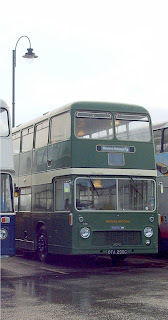 Preserved series 1 Bristol VR 1056 (OTA 290G) will likely not be running this weekend at the Plymouth Hoe bus rally because of recent problems involving her gearbox. The gearboxes for series 1 VRs are in very short supply and it will be very difficult to source one. And the gearboxes have little or no resemblance to those in previous models. The gearbox has probably been warn out simply because the bus has been well over used for such an old and fragile machine. The top windows also are having to be replaced because they have been smashed. 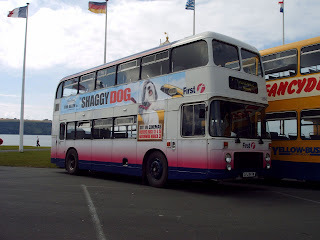 Its a shame because they were the bus’s originals as well and have now had to be replaced with series 2 windows. 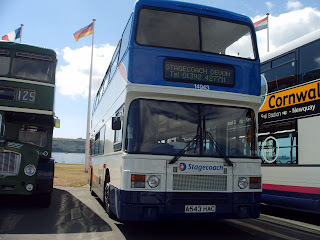 Stagecoach has done this because of First increasing the frequency of the route between Torquay and Paignton. Both companies run the same type of bus though First’s are a bit newer so one will win there. They both run the same frequency as well. But the loyalty of the customers is at the moment with First as Stagecoach has never even come here before. And First are offering the journey for cheaper. First have advertised this at Paignton bus station owned by Stagecoach giving hand outs out about there cheaper fares cost in £1 cheaper than Stagecoach. This resulted in the Police being called in as Stagecoach thought they were breaching the peace. Today the department of transport announced that Virgin would no longer be running the service that they currently run in the countryside. This was given to the European wide company Arriva branding it as 'CrossContry'. Arriva plc, one of Europe’s leading bus and rail operators, today welcomed the decision of the Department for Transport (DfT) to award it the new Cross Country rail franchise. 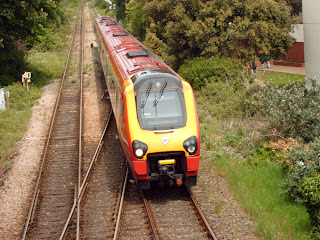 The Cross Country network is the most extensive rail franchise in the UK. Stretching from Aberdeen to Penzance, and from Stansted to Cardiff, it covers around 1,500 route miles and calls at over 100 stations. Arriva will run the franchise under a new CrossCountry brand and livery. The centre of operations will be in Birmingham, at the heart of the network and the largest city served by it. Wi-Fi available to all Voyager and HST passengers, free in First Class. 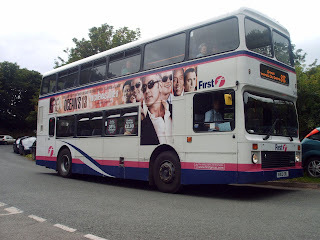 The franchise will run from 11 November 2007 to 31 March 2016, with the last two years and five months conditional upon achieving agreed performance targets. 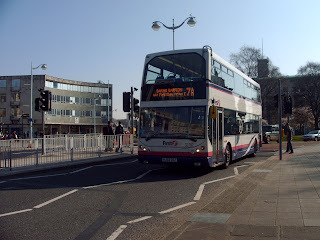 Annual revenue is expected to exceed £600 million in its first full year, including franchise support payments which reflect the current inability of the franchise to cover its operating costs through fares alone. 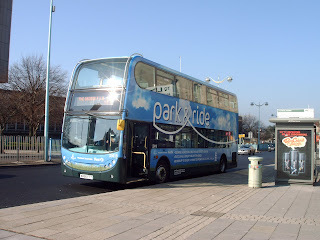 However, by supporting growth in passenger numbers and improving the quality of services, Arriva is committed to reducing government support on the franchise to almost zero before the end of the franchise. Arriva will make cheaper fares easier to obtain closer to the point and time of travel. Saver tickets will continue to be available on relevant services at regulated prices. Whilst prices of the most flexible, full-price fares will rise by an average of 3.4 per cent above RPI, becoming more focused on those who need the added value of maximum flexibility in their travel plans, almost all travellers will have lower-cost alternatives. David Martin, Arriva’s chief executive, said: “We are delighted to have been chosen to operate this major franchise, which advances Arriva’s UK rail presence significantly. “The Cross Country network has many existing strengths but our stakeholder research has helped us to pinpoint important areas where we can improve the passenger experience and make the business more efficient. Our proposals and substantial targeted investment will make rail travel more attractive and support growth in passenger numbers by increasing seating capacity. Arriva is one of the largest private sector providers of passenger transport in mainland Europe, employing more than 34,000 people and providing more than one billion passenger journeys every year. Arriva provides transport services including buses, trains, commuter coaches and water buses in nine European countries: Czech Republic, Denmark, Italy, Germany, the Netherlands, Portugal, Spain, Sweden and the UK. Operations in a tenth country, Poland, are due to start later this year. Arriva’s rail services operate in Denmark, Germany, the Netherlands, Sweden and the UK with Polish services scheduled to start in late 2007. Virgin Rail Group (VRG) said today it was extremely disappointed at the announcement by the Department for Transport (DfT) that its bid for the New Cross Country franchise was unsuccessful. The DfT announced that Arriva plc has been awarded the franchise to operate the New Cross Country franchise from 11 November 2007. Commenting, Tony Collins, VRG's Chief Executive, said today: "We are understandably extremely disappointed at today's announcement and will be seeking an early meeting with the DfT to understand why we were unsuccessful. Our bid was extremely competitive, built on our experience of operating the CrossCountry franchise for the last ten years, during which time we almost doubled the number of passengers and increased performance to regularly exceed 90%. We attempted to strike a balance between an affordable and deliverable deal for the taxpayer, and continuing the high quality customer service that Virgin CrossCountry has created." Despite today's announcement, VRG confirmed it would continue to operate the Virgin CrossCountry franchise to the highest standards until the 11 November handover. Chris Gibb, Managing Director of Virgin CrossCountry, said: "Our aim through our people has always been to provide the best possible service to our customers and we will continue to do this to the end of our franchise. Although November will mark the end of Virgin's stewardship of CrossCountry, the new franchise will build on the legacy of our investment in new trains and improved services, and the skills, experience and loyalty of our people: skills that will be invaluable to the new operator when they begin the New Cross Country franchise." Today's announcement has no effect on Virgin Trains' other franchise, West Coast, which runs services from London Euston to Birmingham, Manchester, Liverpool, Preston, North Wales and Glasgow. The current Virgin CrossCountry tilting services between Birmingham, the North West and Scotland will transfer to Virgin West Coast in December. Local bus company A-Line Travel of St John have recently been going through fleet modernisation by acquiring two new buses to replace other agingvehicles in the fleet currently in storage with no MOT. The first to be acquired was ex-Williams coach E920 EAY a Volvo B10M with Plaxton Paramount bodywork replacing the oldie faithful C-Reg Bedford, which will be used on the Torpoint school run between Cawsand and Torpoint and on other coach trips, as well as private hire as has recently been used for the children of Fourlanesend school on one of her first trips. 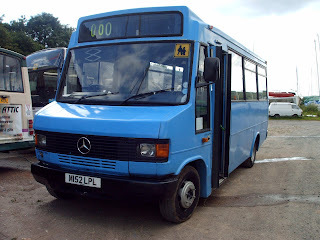 The second bus is ex Rigg’s Minibuses of Swansea a Mercedes 709 registration M152 LPL. 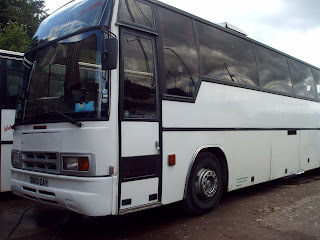 This will replace the ex-Southern Vectis Iveco J238 KDL and another will follow to replace another Iveco J234 KDL. 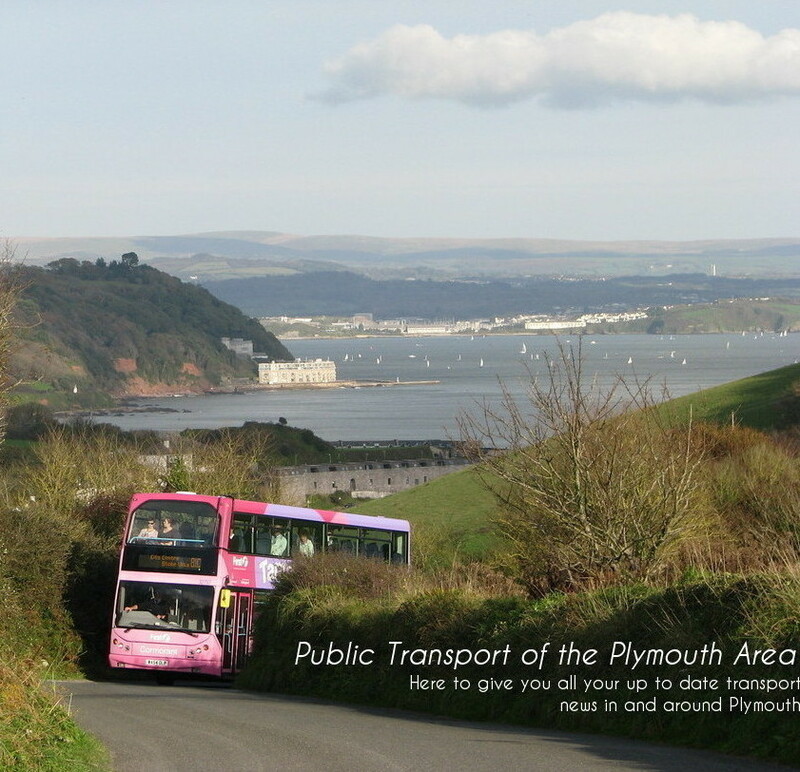 This bus will therefore run the service 80 Cawsand to Cremyll and the 270 Cawsand to Trago Mills. I say very good choices have been made. Well done A-Line Travel! It was announced in March that the Pont L’Abbe would have her charter extended until 2009. But the ex-Duke of Scandinavia on charter from DFDS has been extended so that she will now run Plymouth-Roscoff until late 2008 and then will transfer to run Portsm outh-Cherbourg until the completion of the new multi-million pound new vessel the M/V Bretange which will take over the running of Pont L’Abbe. Pont L’Abbe will leave here in 2008 to make way for the brand new vessel the M/V Armorique costing 110 million pounds which pictured to the left. So therefore Pont L’Abbe could be still running until 2010. So she is saved by the skin of her teeth again. Sorry I have not posted for a while school has been getting in the way a bit. Very recently it has been announced that there will be models made of the hugely popular park and ride Dennis Enviro 400s. 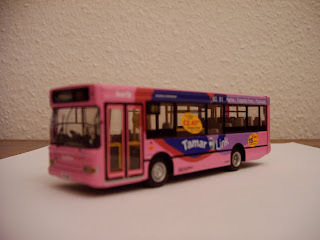 This was announced on First Devon and Cornwall’s official site that the models will be made by the very good model makers ‘Creative Master’ the same people who made the model of the Tamar link Dennis Dart which had as fine detail as adding the actual notices that were in the bus at the time pictured to the left. The model will be avalible in Antics for £30 or at the first travel shops for the same price. It is a limited edition.